How does a comedy improv show become the juggernaut of creative marketing in the region? November 20, 2018: The answer to that is a recent show featuring the region’s top standup comedians including Bader Saleh from Saudi Arabia, Khaled Mansour from Egypt, Nemr Abou Nassar from Lebanon, Ahmad Al Shammari from Kuwait and Ali Al Sayed from the UAE – and they talked about, well you guessed it, dandruff. “I wish you were the dandruff in my head, so I could carry you on my shoulders wherever I go,” quipped comedian Nemr Abou Nassar to an audience reeling with laughter. The improv show tapped into two elements that are loved almost universally: comedy and relatability. The videos from the show went viral and became a part of conversations throughout MENA – garnering more than five million views on You Tube so far. The show started a conversation about a topic that is seldom discussed - yet 90% of population have, in fact, experienced dandruff at some point in our lives. In today’s fast-paced society, grooming can take a backseat with so much to do and so little time to make it all happen. So, Head & Shoulders has taken it upon itself to motivate people to focus on themselves and not let pesky problems like dandruff get in the way of looking fabulous. 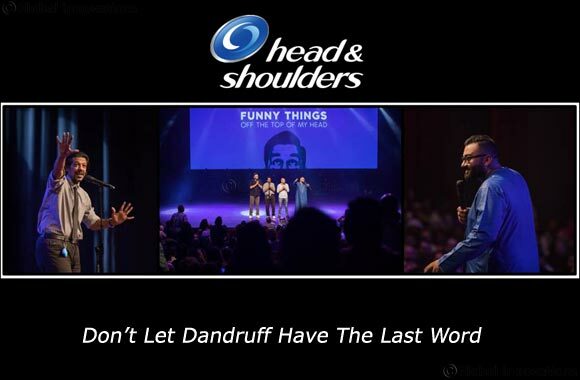 Don’t Let Dandruff Have The Last Word is a classic example of good content speaking for itself. When the comedians made jokes about dandruff, members of audience could relate to the struggles of maintaining a healthy scalp. With the influx of videos on social media each day, digital marketing is at a risk of becoming futile and redundant. However, standup comedy gave Head & Shoulders a content edge. From standup comedians to audience members, Head & Shoulders managed to capture a space in our minds – a simple solution to our hair woes. It began with an unbeatable idea, a long-lasting product and not letting dandruff have the last word.